The Belcolore system incorporates Bomanite Color Hardener onto the surface of the concrete at the time of placement and finishing. 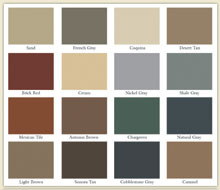 The Color Hardener is broadcast over the concrete and trowel finished in a fashion similar to conventional concrete. 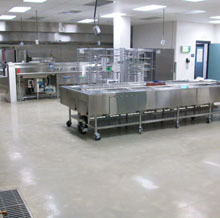 Once cured the concrete is paste polished to the required gloss level and then processed as per the standard VitraFlor System. The primary benefit to Bomanite Belcolore Custom Polishing System is the superior abrasion resistance and range of color options along with the lack of need for topically applied dyes or stains. Bomanite Color Hardener can provide very intense color options in a much wider palette than with integrally colored concrete while at the same time greatly improving the abrasion resistance of the concrete. Belcolore by Bomanite is intended primarily for new construction or major renovation projects and only with paste polish aggregate exposure.